This press release (Google translate here) is rather unusual. The Herzog August library in Wolfenbuttel hold quite a collection of manuscripts and rare books. They’ve just introduced a new service to allow you to look at these, via a webcam, in real time. What you do is book an appointment with the library to look at a book. 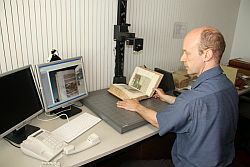 Then when you telephone, a library staff member holds the book under a camera, and the page image is sent via a web cam. In this way you can tell him to go back/forward, look at this page/that one, and consult the book remotely. The library honestly admit — what some German libraries will not — that for a researcher to fly over from Australia or Japan to see if a book contains anything of interest is “hardly possible.” This is an alternative. The article includes an image of what is happening, which illustrates the process. It is a very imaginative idea. Well done Wolfenbuttel for thinking laterally on this one. I wondered if they would charge for the service. Probably they are dipping their toe in the water at the moment, and quite right too. If someone got greedy, that could kill it pretty quickly. But if the idea took off, I think that they *could* get away with a trivial (in the eyes of the purchaser) charge, so long as it was easy to pay (say by paypal). A charge that no-one cares about is ideal; say $5 for an hour. It’s all about working out what amount is “beneath notice” for someone who is impecunious. You can charge people as often as you like, so long as you do not inconvenience them by making the charge something they have to stop and think about, or the method of payment something they have to struggle with. (Mobile phone companies are past masters at this, and how else does iTunes work? I don’t keep my credit card details on Amazon any more, for precisely this reason!). Make the charge trivial, and the paying of it trivially easy, and no-one will baulk. But … only, only, once the service gets established. It may not, of course. But the thing to do is find out by making it free initially. Also, what might be OK for a one-off would not be OK for someone who wanted to spend hours at this. If it gets going, have a “season ticket” price, discounted, as well as the price for one hour. They also ought to invite feedback on how it works. I’d have some already! I also wondered about language barriers. What I would hope is that they keep copies of the images recorded by the webcam, and post them online (or allow users to contribute them). If they do very much of this, they will quickly acquire a digital archive willy-nilly. I see that Wolfenbuttel are already digitising their mss — well done again, chaps — although the website sort of disguises this. One thing I *did* find difficult was finding an online catalogue of manuscripts. I know they have mss, and the article implied the catalogue was online; but I couldn’t see it.